> > > > work with a new software architecture for persistent memory. > > > > non-volatile, high-capacity memory for in-memory databases and other applications. > > > > particularly around security and serviceability. > > > > As always - comments, questions, and feedback are appreciated. > > > Has anyone ever done a comparison of Xpoint to flash DIMMs? > > possibility of GC, which would then tie up a DDR4 transaction for a VERY long time. > > a lot more sense, but there is still room for improvement. > > From a product standpoint, Diablo memory is dead and Sandisk UltraDIMM is DDR3. So why bother? > If I recall correctly Micron launched a product that consisted of DDR4 dimms with a super cap and flash. > When power goes down the DRAM contents are written to the flash but otherwise it acts as a normal DIMM. Not in the same range of capacity. But performance is probably very good. Michael S (already5chosen.delete@this.yahoo.com) on July 24, 2018 6:51 am wrote: > Emil Briggs (me.delete@this.nowherespam.com) on July 24, 2018 6:30 am wrote: > > David Kanter (dkanter.delete@this.realworldtech.com) on July 24, 2018 4:31 am wrote: > > > Teemo (teemo.delete@this.riot.com) on July 23, 2018 5:38 pm wrote: > > > > David Kanter (dkanter.delete@this.realworldtech.com) on July 23, 2018 10:02 am wrote: > > > > > In honor of our anniversary, I have a new article on Intel's 3DXP DIMMs: > > > > > > > > > > Intel will offer 3DXP-based DIMMs (previously codenamed Apache > > > > > Pass) that use the DDR4 interface on the next-generation > > > > > Cascade Lake server processor. The first DIMMs will be available in 128GB, 256GB, and 512GB capacities and > > > > > work with a new software architecture for persistent memory. > > > > > Intel and its partners have enabled the new persistent > > > > > memory programming model for Java, Linux, VMware, and Windows and many customers are eagerly awaiting the > > > > > non-volatile, high-capacity memory for in-memory databases and other applications. > > > > > > > > > > I also point out many of the areas Intel has been less than forthcoming, > > > > > particularly around security and serviceability. > > > > > > > > > > As always - comments, questions, and feedback are appreciated. 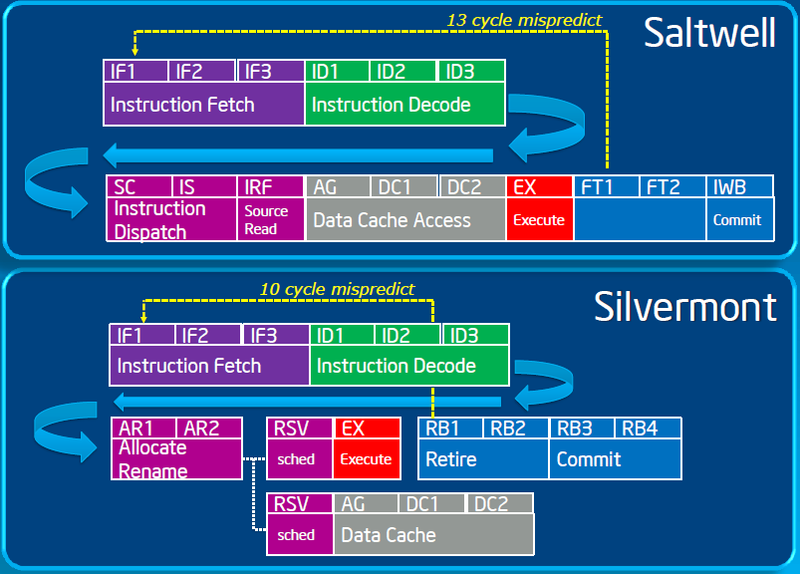 > > > > > > > > > > David > > > > > > > > Has anyone ever done a comparison of Xpoint to flash DIMMs? > > > > > > Flash DIMMs are an abomination. The access latency is terrible, and you still have block > > > size mismatches. Most DDR4 fetches are going to be 64B, maybe 128B. Flash accesses are > > > much much bigger. So you are wasting internal bandwidth. Moreover, there is always the > > > possibility of GC, which would then tie up a DDR4 transaction for a VERY long time. > > > > > > Fundamentally, flash on DIMMs is a technology mismatch. 3DXP makes > > > a lot more sense, but there is still room for improvement. > > > > > > From a product standpoint, Diablo memory is dead and Sandisk UltraDIMM is DDR3. So why bother? > > > > > > David > > > > If I recall correctly Micron launched a product that consisted of DDR4 dimms with a super cap and flash. > > When power goes down the DRAM contents are written to the flash but otherwise it acts as a normal DIMM. > > > > NVDIMM-N > Not in the same range of capacity. > But performance is probably very good.